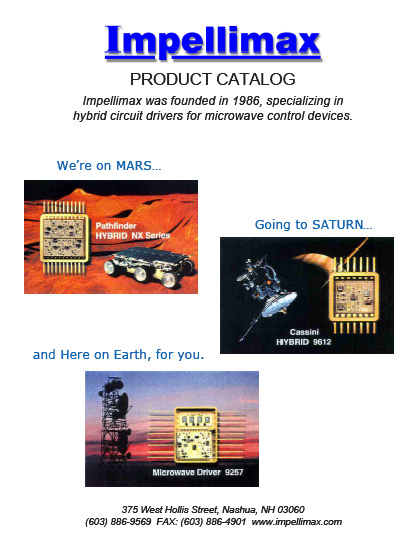 Impellimax designs and manufactures special assemblies using many microelectronic technologies. 27 pg, K Series Data Sheets feature a wide range of “Building Block” devices all housed in the 14 lead K package. These parts provide the electrical functions that system designers most typically need, and in a format that is low cost, hermetic, and very compact. 47 pg, with sections on PIN & GaAs Drivers, Linearizers, and Obsoletes and Special. Several one-page appnotes also included. 12 pg, covers a wide range of topics including Unpackaged Substrate Drivers, Space Products, MEMS and Piezo drivers, etc. 8 pg, covers Pulsed Drain Supplies, Power Supply Sequencers, Timed & Shaped drivers for cascaded amplifiers, etc. 12 pg, covers Linearizer applications in Driving PIN and GaAs MMIC Attenuators, Linearizing Varactors, etc. 2 pg, overview of line of hybrid products. 2 pg, overview of PCB capabilities. Click Here to Request Printed Catalogs.